What’s in a Puffin Pack, I hear you say?? Just imagine…. visiting Skomer Island…..you’ve bought your landing ticket from Lockley Lodge and have it held tightly in your hand, ready to show it to the skipper of the ferry boat, as you board thee Dale Princess to take you on the short boat ride over to Skomer, amazed at the puffins rafting and laughing at the funny little cumbersome way they try and take off, from the water. 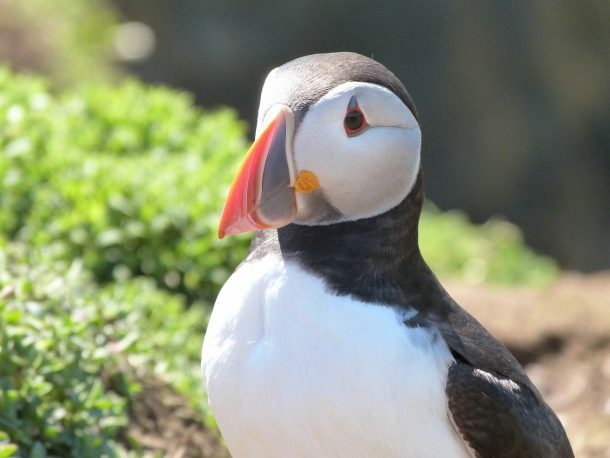 You’ve landed on Skomer and taken the steps up the cliff face to reach the briefing deck, where you’ve met the Warden and had a chat about Skomer, where to go and what to see. And so, you’re off…..up through the path that will become blue– full of bluebells, excited to see your first puffin on land, by their burrows, and then…you spot one, then another one, and then you round the corner…..and then there’s thousands!!!! And then, all of a sudden hours have passed by and you’re peckish….well, good job you have your Puffin Pack! You can find a nice spot, overlooking the basking seals on Garland Stone, and if you keep your eyes peeled, you may well see some Porpoises and then grab your Puffin Pack and enjoy all the goodies inside! In here you will find lots of homemade and local goodies to keep you going all day…freshly made sandwiches, made with bread baked that morning; yummy tasting welsh cakes and a Welsh waffle bar, one of your five a day– fresh fruit, a drink and a selection of energy giving nuts & seeds, with a ‘good for you’ packet off crisps, (rather than one full of additives). You’ll also find a keep sake of your day and lots of valuable information about Skomer Island to help you make the most of your day! Sit and enjoy your picnic, then continue refreshed, over the rest of the island, meandering back in time to pick up the ferry boat back to the main land. 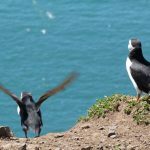 We are only a short drive away from the embarkation point to Skomer Island. So, to celebrate, any booking made this week direct with us here at Fields Lodge will receive a free Puffin Pack!! Use the Make a Booking Button above to make your boking!